DePaul Alums Compete with Para..
After grabbing a newspaper playbill and walking through the stage doors at Theater Wit, I found myself immediately wrapped up in the frantic energy of a marble-coated, old-Berlin hotel. Maids, bellhops, and telephone operators dust tables and mime phone calls throughout the theater as the audience processes in. The concierge, stick-straight behind a podium near the audience doors, darts back and forth between smiling at the new audience members walking in and glaring at the various hotel employees scattered throughout the wings. 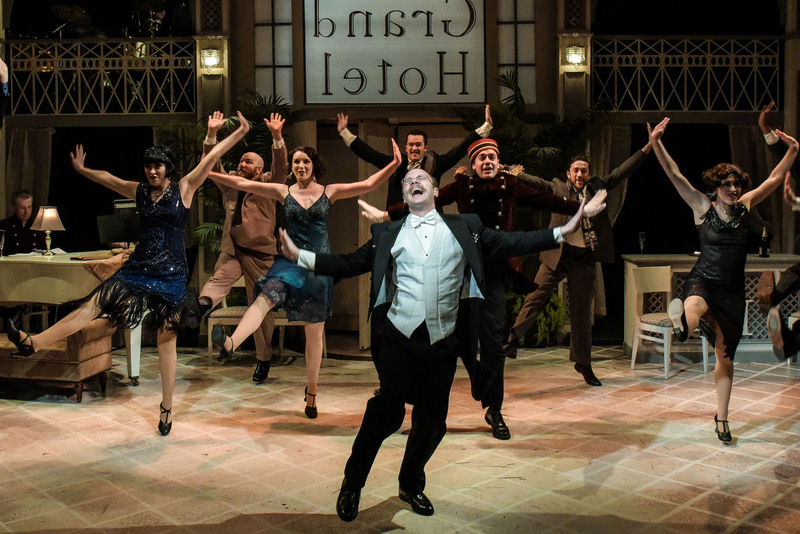 Kokandy Productions’ preview performance of the delightfully dark, old-Berlin show “Grand Hotel” was a musical immersion into another era. The show experienced a few technical difficulties with sound, but the immersive staging and charming cast made for a worthwhile performance. “I thought the ensemble was great and I liked how the set extended into the audience,” said Callie Rafferty, an audience member. “Grand Hotel” takes place in the finest hotel in 1928 Berlin, where great lives and great illusions of wealth are on display. A cast of opportunistic, rough-around-the-edges typical 20s characters swing through the hotel’s revolving doors: an in-debt baron, an unhappy colonel doctor, a typist looking to make it in pictures, a well-off businessman, an aging ballerina accompanied by an entourage, and a dying man wanting a taste of the good life. The show, originally debuting on Broadway in 1989, is based on the 1928 play and novel “Menschen im Hotel” by Vicky Baum, which then spawned a 1932 film at MGM. From creating the lobby-like atmosphere before the show to Charlestoning in choreographer Brenda Didier’s dance numbers, every actor and singer was engaged and energetic on stage. Leryn Turlington’s Flaemmchen dynamically danced her way through an unfortunate crackling mic, and Micelle Jasso’s portrayal of ballerina Elizaveta was the perfect mixture of guarded and vulnerable. 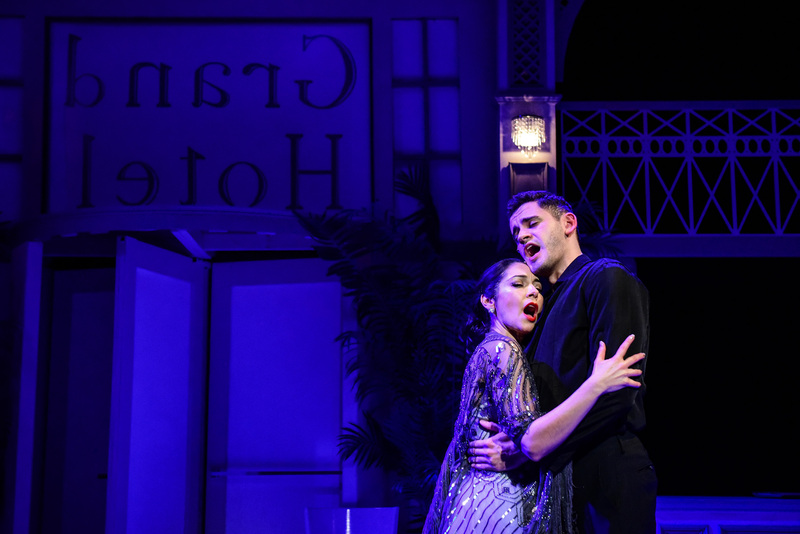 The vocalists of the show were strong through and through, especially DePaul alumnus Erik Dohner’s operatic Baron Felix Von Gaigern and Liz Norton’s unrequited Raefella. The show gets the biggest lift from Kringelein, the sweet dying man, and the openness with which Jonathan Schwart plays him. This lightness can also be seen in the friendly bellhop, Erik (Parker Guidry), and a delightful song and dance from two American jazz musicians at the hotel (Travis Austin Wright and Maurice Randle). Director John D. Glover made use of his ensemble cast to set the hotel abuzz with background workers and fill out some swell dance numbers. The set is an intricate hotel lobby with chandeliers, fake marble flooring and balcony wings that are used to display more intimate hotel rooms and overlooks. “Grand Hotel” is an exciting musical dip into old-Berlin, but knowing the time period of the show, one should not go in expecting only goofs and romance. However, “Grand Hotel” uses the dramatic irony of the time period to its advantage to both support and subvert the audience’s expectations for different characters. This show runs without an intermission, but the lack of break helps keep the audience engaged and the plot rolling. Non-profit Kokandy Productions is behind the show, which runs at Theatre Wit every Thursday to Monday from now through May 27.